Austin bosses seeking 2013 date? Organizers of the United States Grand Prix in Austin have responded to Bernie Ecclestone's deadline, suggesting they are actually seeking a 2013 date. Earlier today, Ecclestone warned that unless he has a signed contract and the relevant monies by next week, the 2012 event, due to be held at the Circuit of the Americas (COTA), is cancelled. 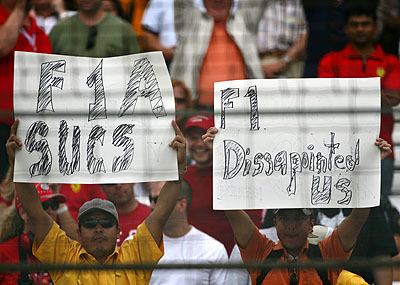 "We have been excited for and working towards a 2012 USGP race and now understand that Mr. Ecclestone is interested in moving the Austin race to 2013," stated Steve Sexton, president of Circuit of The Americas. "We know the U.S. market is important to the teams and their sponsors and 2013 certainly allows time for the Circuit of The Americas to be ready." At the beginning of the month, Ecclestone admitted concern regarding the Austin event amidst speculation that work on the site would not be completed in time. Tonight's statement from the Austin organizers appears to suggest that the speculation was not wide of the mark and that a 2013 date would be far more suitable. If the 2012 date really is out of the question, as many believe it is, a signed contact and $25m is the very last thing anyone would want to be handing over. This is rapidly becoming a total farce. Clearly the sport has learned nothing since 2005 (above).